This is a Renaissance brooch made from silver Precious Metal Clay (PMC) hardened in a kiln. The stone is a simulated ruby. A nautural pearl hangs on a sterling silver wire. The piece has a sulfer of liver patina (added before the pearl, of course). 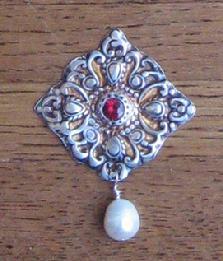 The brooch has been submitted to the Best Use of Gem competition for Sapphire Joust 2011.